← UNFCCC – A Little Advertisement can help save Earth. Earth Day Special: Time to move beyond the hyperbole! As I held the morning News paper, the irony of Earth Day struck me with a megaton force. Perhaps the editor of the paper – DNA planned it such. He must have and I compliment the News paper for that. Keeping the standard articles and the political message form the Government on page Seven; the front page has no mention of Earth Day but an article of the crop loss for the third successive year of Alphonso mangoes in the State of Maharashtra, India. If you thought the year-on-year rise in the price of alphonso mangoes was only because of inflation, you’ve got it wrong. Farmers cultivating the prized fruit say it won’t be long before the alphonso belt, from Ratnagiri to Sindhudurg, becomes another Vidarbha — known for its farmers’ suicides. At first glance, it seems the only problem is that the alphonso belt hasn’t recovered from the ravages of 2009’s Cyclone Phyan. But a closer look shows it’s not just nature that’s responsible for this worrying state of affairs. Mango farmers allege that a series of factors including flawed compensation and insurance policies, a government push to build power plants in this fertile region, policy bias in favour of fruits grown in areas where political heavyweights come from, are also to blame. 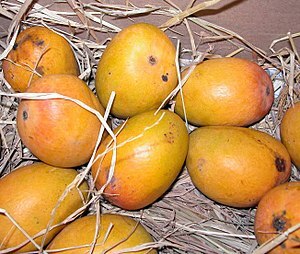 A study by the Konkan Krishi Vidyapeeth shows production of alphonso mangoes has plummeted drastically in the past three years. The average output for alphonsos is 1,200 kg a hectare. But in 2010, the output fell to 384 kg a hectare and is predicted to only be 180 kg a hectare in 2012, says the study. No wonder then that mango farmer Prakash Salvi, 51, from Pawas in Ratnagiri, is staring at his third successive crop failure in three years. “This year seemed good since flowering began early. But tender fruit fell off leaving 2-3 fruits on a tree. My debt has grown and I may have to sell some land to pay debt,” he laments. “We’ve only heard of the Vidarbha farmer suicides. Now, it might be a reality here too.”Just 35 km away, orchard owners in Maalgund village are also worried. “The weather gods leave us bruised and government policies unfailingly rub salt on them,” says Vivek Bhide, 37. Recounting the horror of November 11, 2009 when Cyclone Phyan struck, he said: “Heavy winds upto 140 kmph uprooted 59,000 trees in 3 hours according to the government’s survey. But we were only given Rs400 per tree as compensation — less than the cost of extracting the uprooted tree.” In the heart of alphonso country at Devgad in Sindhudurg district, Anand Desai says the government is determined to wipe out the fruit. “The alphonso is often cited as the first reason to protest against the 22 power projects, including Jaitapur, that the government has planned here. Wiping it out like this will destroy the biggest plank in the protests,” he says while showing us his idle pulp processing plant. “We are usually very busy this time. But this year we are still awaiting the mango.” Farmer after farmer wondered why terms and conditions of farm insurance policies were stacked against them. Alphonsos grow best in temperatures of 30-32° C during the day and 12-13°C at night. However, this area has had severe winters in recent years with temperatures falling to 7-8° C. However, crop insurance only provides for a rise, not drop, in temperature. Insurance also only covers losses due to rain between December and May. The monsoon onslaught from June to September is uncovered as is the period of occasional heavy rain around Diwali. Despite this being a coastal zone, insurance does not consider wind a factor either. KKV ex-VC Dr Shrirang Kudrikar told DNA that an important reason for the fall in output is the faulty use of pesticides. “This meant that pests developed immunity to even a double dosage. This also increases costs significantly.” While local agricultural offices say they only follow state orders, Mantralaya sources admit most policies on fruit are planned with grapes and pomegranates in mind. “Unlike the mango, these fruits come from Western and North Maharashtra, represented by political heavyweights.” But state agriculture minister Radhakrishna Vikhe Patil insists the government is in touch with farmers on these issues. “We will get their feedback and see how we can best work out policies to help them,” he said. The reasons given are what every climatologist and environmentalist have been talking for long. Many of my articles here also point to that – Business Risk due to human induced climate change. That unplanned and myopic views on ‘development’ which is more of self aggrandisement than real long-term approach for sustainable growth is sadly the norm rather than exception. It can be found in all States of India and beyond it shores too. To see sustained development we perhaps need to look beyond the obvious and think totally out-of -the -box. We must IPL’ese the Politics of the country. Maybe the sample method can be improved and used in other countries too. Let me elaborate: IPL ( Indian Premier League -Cricket ) has the world’s best of best pitted against each other. It would be nothing especial in that, but for the fact that no team comprises of players from any particular country or club. In-fact two champions from the same club or country square-off against each other and try hard to make their respective team win! Imagine the best of the best politicians, who strongly believe in Sustainable Governance without the motive of self aggrandisement when deciding the fate of the Eco-system of the Country vett each and every project which is tabled for permission to start work on. Be it permission for a Nuclear Power Plant, Thermal Power Plant, Sea Port, Iron & Steel Factory or Mining and even new townships. They are the final arbitrators in deciding the fate of the project. Elected directly by the public, irrespective of whether they hold a seat in the Assembly/Senate or Parliament. Respected by their political parties and people alike. Only they would have the powers to put any controversy to rest because they can’t be identified with any single party ideology, save the supreme ideology of Saving the only Living Planet. And in the process saving Business from doom.This even the skeptics would agree to – without business to support the economy, there would be no money in the coffers of the political parties. Thus ruining their chance to govern.